TPCE is an ACPE-Accredited Provider for CPE Programs. South College School of Pharmacy. TPCE exists to support and deliver high quality continuing pharmacy education programming and provide pharmacists and pharmacy technicians across the state with valuable tools, skills, and resources necessary to promote optimal patient care and outcomes. TPCE works with pharmacists, pharmacy organizations, health care entities, and regulatory bodies to identify educational needs, develop high-quality educational programs, and deliver programming in a cost-efficient and convenient manner. TPCE partners with organizations to serve as the ACPE-accredited provider for CPE activities at the local, state, and national levels. TPCE provides resources for attendees, including online handouts, user credit transcripts, online evaluations, post-tests, and completion certificates. TPCE delivers convenient, web-based credit redemption and automated CPE processing for program attendees through the use of individualized email messaging. TPCE provides user support and troubleshooting to ensure that attendees receive the highest level of satisfaction possible. 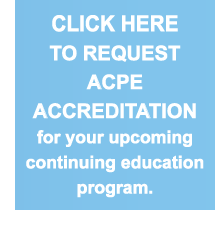 Complete THIS FORM to request ACPE accreditation for your upcoming continuing education program. For additional information about TPCE, email the TPCE Director at tpce@tnpharm.org.